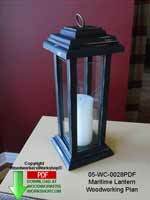 Create your very own maritime lantern! You can probably make this with scrap wood you have in your workshop. Use the glass or not, you could even use mirror on two sides to enhance the lighting produced by the candle. While rated a beginner skill level for its simplicity of design and construction, some experience with woodworking and design would be an asset. Instructions allow for leeway in design and construction. Tools needed: Table saw, scrollsaw, router in table and other common workshop tools. Woodworking patterns designed by WoodworkersWorkshop.com. I built several lanterns using your plans. I shortened the height and we used them at our wedding for table decor. Thanks for the plans.